T3 Agenda: The Vans x The North Face collab. Mixcder's MS301 wireless headphones. And more! Eternally rad shoemaker Vans has partnered with outdoor clothing maker The North Face this season to create an exclusive collection of apparel, accessories and footwear for the cold winter months. 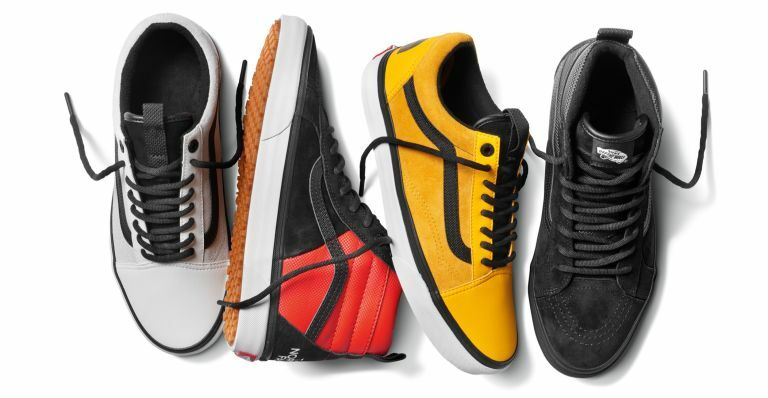 First there's the Vans Old Skool and Sk8-Hi silhouettes, which combine unique and striking colour schemes that make you look cool and keep you warm and dry along the way. With help from The North Face's Thermoball tech, Vans updated the classic Torrey Jacket with the synthetic PrimaLoft fill to guarantee lightweight warmth in the coolest of conditions. The Vans x TNF Torrey MTE quilted jacket is featured in three colorways – red, black and yellow, and signed off with a Vans x TNF embroidered patch on the front. In accessories, Vans reimagines the iconic The North Face Base Camp Duffle, modified for the first time ever to include a skateboard strap. The collection ranges from £95 to £190. American audio specialist Mixcder has announced the UK availability of its latest headphone, the MS301. Inside, the MS301’s are equipped with 40mm ultra large-aperture backed dynamic drivers with advanced APTX-LL and shock sound to deliver a unique sound performance, with an incredible booming bass, a detailed midrange, and extended treble. With the latest Bluetooth 4.2 for fast pairing and strong capability and APTX-LL technology, the MS301’s provide lossless transmission and crystal clear, smooth sound without compression or interruptions. The high capacity built in 500mAh battery allows for over 20 hours of music play or talk time and a standby of 2200 hours. The Mixcder MS301 Wireless Bluetooth Headphones with aptX Low Latency are available from Amazon for £69.99. Alfa Romeo has released some new intriguing new details about the hotly-anticipated Alfa Romeo Stelvio Quadrifoglio. Due for release next summer, the super-fast SUV upgrade is powered by a whopping 2.9 V6 Bi-Turbo petrol engine, which produces a top speed of 176mph and can take the driver from zero to 62mph in just 3.8 seconds. The power of the Stelvio Quadrifoglio was recently displayed as it clocked the new record for its class on the iconic Nürburgring, with a staggering 7 minutes 51.7 seconds. The Alfa Romeo Stelvio is now available to order in UK dealerships and the range-topping Alfa Romeo Stelvio Quadrifoglio will join the line-up in the UK in summer 2018. Is this the most beautiful car ever made? Oakley has launched its latest goggles - the Fall line - a fusion of a rimless goggle and a cylindrical lens shape that provides an unrivalled peripheral view. The Fall line also comes equipped with Prizm – a lens technology that dramatically enhances detail to improve performance and provides ultra-precise colour tuning. Because snow environments are dominated by white and lack any particular colour Oakley have created a lens that helps riders see details earlier, faster and deeper, resulting in an enhanced experience. From bright sun to snow/overcast, there are 6 different lenses, from Prizm black iridium for bright sun to Prizm HI pink iridium for snow and low light conditions. The Fall line is priced at £180.